These superheroes are here to save your party from boredom! 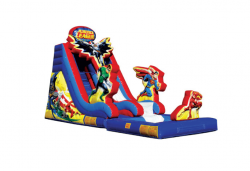 Your mini superheroes will love the life size 3D graphics of their favorite DC Comic characters including Batman, Superman, Flash, and Green Lantern. We recommend superheroes in training ages 5 and older. They can scale the climbing wall with inflatable steps and handles to the top of the 15ft slide. The straight down slide is as fast as superman! A fully enclosed platform at the top and netting above the slide will keep little superheroes safe. As always, our inflatables are made using lead free and fire resistant vinyl for your safety.